We built several elements in this play garden. The Look-out is designed to conceal a bunker and take small children up into the canopy of the trees. The steps and ramp take the children on to the roof of an old concrete war bunker. From there they can look down over the whole garden. Overlooking the bunker is a giant old oak tree and a beautiful winding elm tree which have both been dropping leaves and seeds onto the flat bunker roof, creating a totally self-seeded roof garden. The children can now view this wonder at eye level. 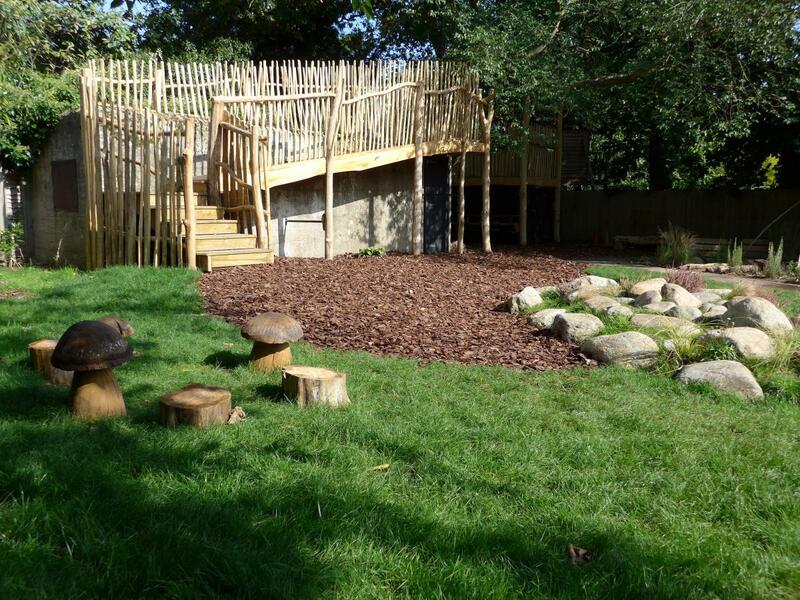 At the entrance to the Nursery School we made a Woodland Screen to disguise a less appealing awning structure, made from sweet chestnut branches and planks we had milled from the thicker ends of the trees for The Look-out. We were aiming for a very woodland feel, completely different to a picket fence. When building The Look-out with its bridge and ramp, the uprights and handrails are made from sweet chestnut from trees we felled locally. The chestnut palings were from a coppice in Kent, and the planks for the Mud Kitchen were from the same tree used for the wall plates at The Hideaway in Haverhill. We used stress graded timber for all joists and for the decking, adding non slip grip where needed, to keep the cost as low as possible. We also cut some yew rounds for displaying letters and numbers throughout the garden and we made a chestnut box for the small water tank in the Mud Kitchen. We had a lot of fun working alongside Alice Willitts of Willow & Wren who designed the whole play garden. It was the first project of this kind that we hadn’t designed ourselves, but her knowledge of what we had done in the past enabled the design-to-build process to go really smoothly. Along with our structure and screen, Alice also built a Rocky Hillock, sand pit with giant smooth boulders and water pump, a hazel Tee-Pee, log borders, fairy circle, willow tunnels, garages and race track... the list goes on. It is a truly magical garden for the children to enjoy.